Taiwanese manufacturing giant Asus has been on a mission to brings its core values to every part of the PC and consumer electronics space. Spearheading efforts to woo the enthusiast and early adopter, who usually have significant money to spend on hardware, is the Republic of Gamers (RoG) line. RoG now extends to 10 different PC segments, from backpacks to graphics cards, and the humble monitor has been a key avenue for RoG proliferation in recent years. This is 34in super-widescreen, curved monitor with a native 3,440x1,440 resolution. Such characteristics elevate it to the very premium end of the market, with the likes of LG and Acer retailing similar monitors on the north side of £700. The kicker here, for gamers at least, is the dual benefit of G-Sync compatibility and 100Hz refresh rate. Let's take a closer look. Asus opts for a subtle 3800R curvature for its best screen, which is in keeping with practically all other 34in displays available on the market. Styling is beautiful, particularly from the easy-to-attach stand that provides a very solid base. It lights up red and gives off a pleasant hue when activated through the 'Light In Motion' feature of the OSD. Be mindful that the three-legged stand is quite deep - finishing about 30cm behind the screen - so make sure there's plenty of room on the desk. The clean aesthetic is helped by having no buttons on the front. Asus uses high-quality plastics for the main chassis, but we'd prefer brushed aluminum at this price point. At 11.2kg, the ensemble has significant heft and the base doesn't move as you adjust the monitor's positioning. There's 115mm of height adjustment, 25° of tilt and 100° of swivel. The massive horizontal size precludes the PG348Q being put into a portrait orientation, but you do have the option of using the VESA mounts at the back instead. Coming back to the monitor, the screen sits inside a frame, meaning there's a 10mm gap - on either side and at the top - between the edge of the display and the casing. That gap is reduced to a couple of mm on the bottom edge due to the way in which the plastic casing sits closer to the screen. This is not a frameless design, then, but the bezels, so far away from your peripheral vision, don't detract from the overall experience. What's more, once you get used to the curvature, you forget it's there. 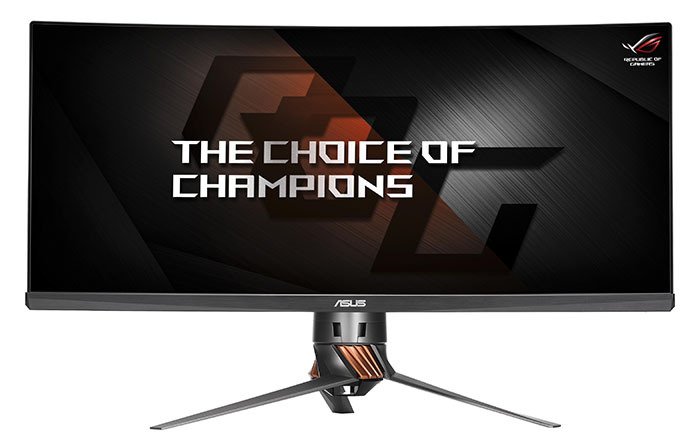 It's around back you spot the familiar Asus on-screen display (OSD) joystick which we believe to be the best and simplest system of adjusting the monitor's settings. It's very quick and intuitive to use, offering access to most commonly-used parameters, including reducing blue light. A bunch of modes are also present, and we found the 'Racing' one to provide an optimum balance of 2D IQ and 3D smoothness. Asus provides a number of extra gaming-specific features such as various overlays through the dedicated GamePlus Hotkey, too. The button directly below, known as Turbo Hotkey, controls the maximum refresh rate. This is a good time to talk about the panel inside, the LG AH-IPS LM340UW2-SSA1 seen on numerous other models. 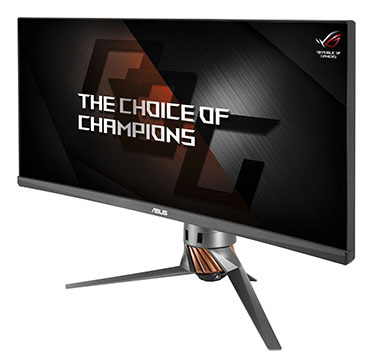 Specified with a default maximum refresh rate of 60Hz, which is how the monitor ships, Asus has some nifty technology to boost it to 100Hz via the dedicated button or through Nvidia's control panel. Really, as a gamer, there's every reason to keep it at the maximum 100Hz unless the game doesn't support it. Premium G-Sync monitors usually carry a separate mode called ultra-low motion blur (ULMB) where motion blur is reduced by changing the way in which the backlight is strobed. G-Sync and ULMB cannot be run together, but, unfortunately, ULMB is not supported on this model. We guess the reasoning is that G-Sync is the obvious and biggest draw. A clip-on section is removed to access the inputs. The PG348Q houses a single HDMI and DisplayPort connector. While both will run just fine at the native resolution, DisplayPort is required for the maximum 100Hz refresh rate; HDMI is limited to 30Hz. This is a monitor-side limitation as it doesn't support HDMI 2.0. 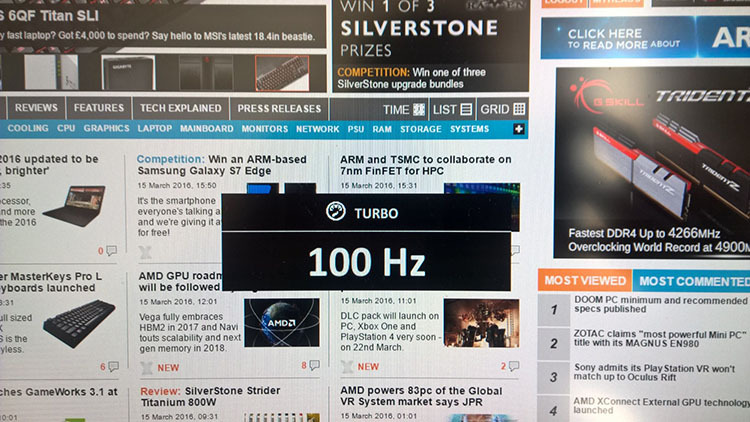 What's more, speaking of limitations, we can infer the maximum 100Hz refresh rate is a product of using DisplayPort 1.2; you will need DP 1.3 for 3,440x,1,440 screens with the upcoming 144Hz refresh. Finishing off the back, there's also a four-port USB 3.0 hub and a couple of 2W speakers. Venting at the back is more for decoration in our opinion; the PG348Q employs a custom heatsink for better heat dispersal than the generic Nvidia heatsink and the monitor never becomes warm during testing. 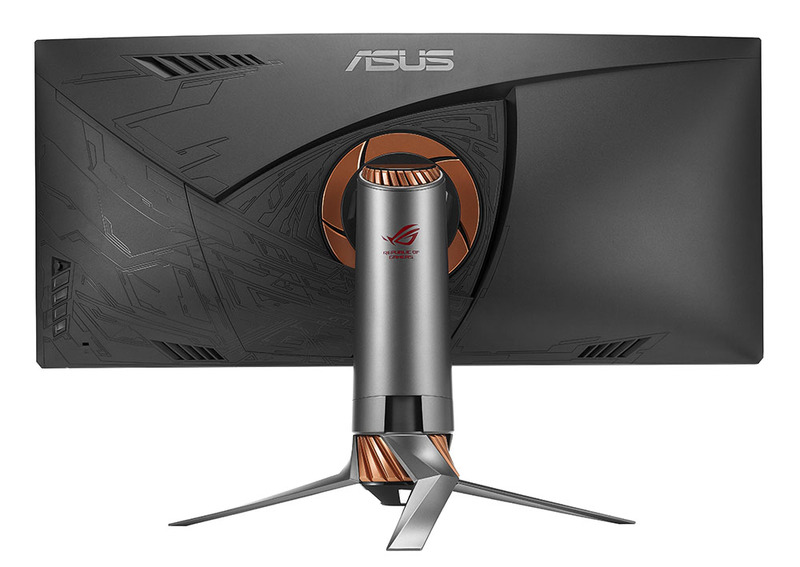 The slim-ish profile is kept by having an external, brick-like power supply common on high-end Asus screens over the past two years. 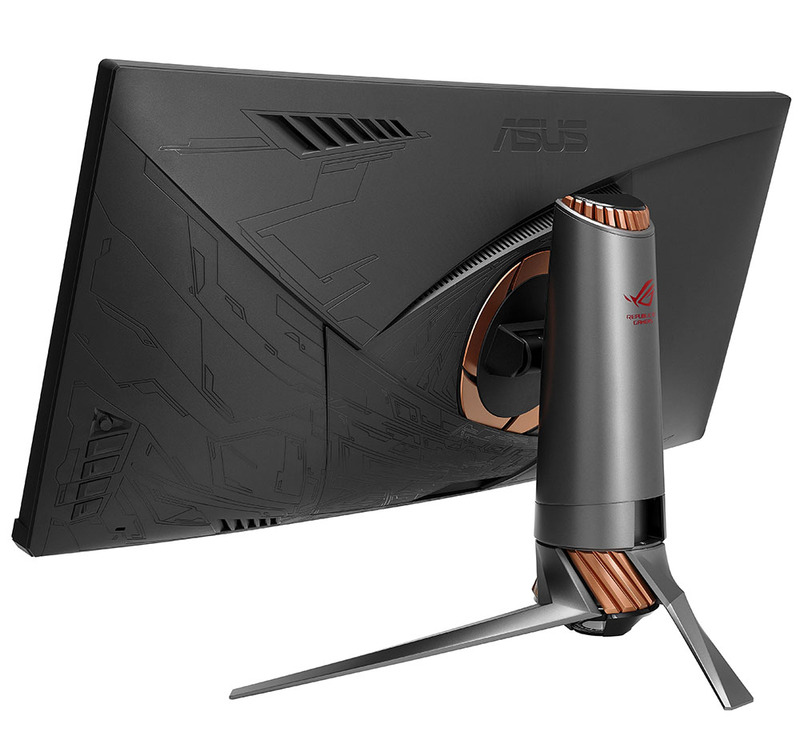 Backed by a three-year warranty, the Asus RoG Swift PG348Q is undeniably similar to the Acer Predator X34 that, as far as we can tell, uses the same panel and has the same vital characteristics. Let's now see how it performs.